Sharing what I think is Mmm…Sarap! With the hot weather we’re having, nothing tempts better than a dessert. Blooger Monica Urrutia found one. I am now on a mission to try new restaurants that appeal to me as quickly as I can. Flip Side Desserts had only been open for about four weeks and was a few blocks from work, but I wasn’t able to visit until recently. 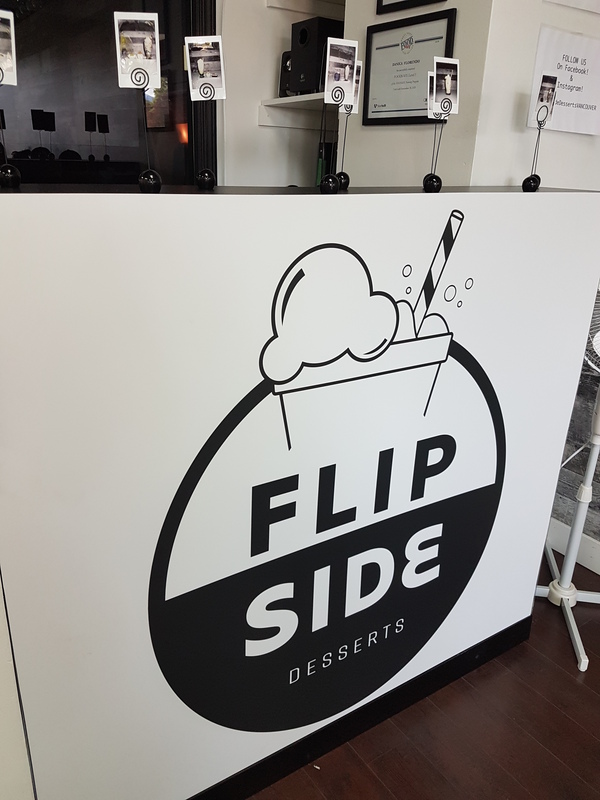 Flip Side is a dessert stop with a lot of Filipino flavour offerings as well as other flavs for broader appeal. I like the clean lines set-up inside, with about twenty seats available, and light and easy decor. There were five in our party and we ordered three simple shakes and one monster shake: two halo-halo and one avocado simple shakes and one chocolate monster shake. (I was sharing the monster shake.) Each shake comes with a different flavoured wafer stick depending on your order. 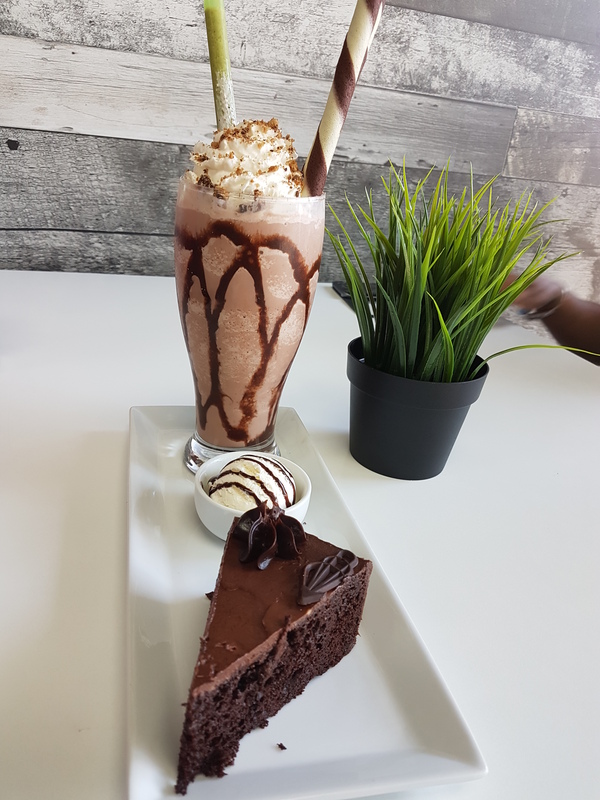 It appears that monster shakes are made up of one simple shake plus two additional pre-determined items, in my case a slice of chocolate cake and a scoop of vanilla ice cream with drizzled chocolate. I had the Chocolate Monster as J. wanted chocolate cake. Avid readers will know I am not a dessert fan in general. However, I did enjoy and completely finish the chocolate shake and ice cream. The shake was cool, refreshing, and not overly sweet. It also had a nice dusting of pulverized nuts on top. I had a bite of the cake and found it moist and again, not too sweet, which is good in a dessert for me. D. and G. both had the halo-halo shakes and commented that the ube flavour may have come from a powder, rather than fresh ingredients. They did have pinipig sprinkled on top, which added to the halo-halo feel. However, D. commented that she enjoyed her shake. R. had the avocado shake. She did not recall having anything sprinkled on top of her whipped cream, but she like the sweet levels in her shake.